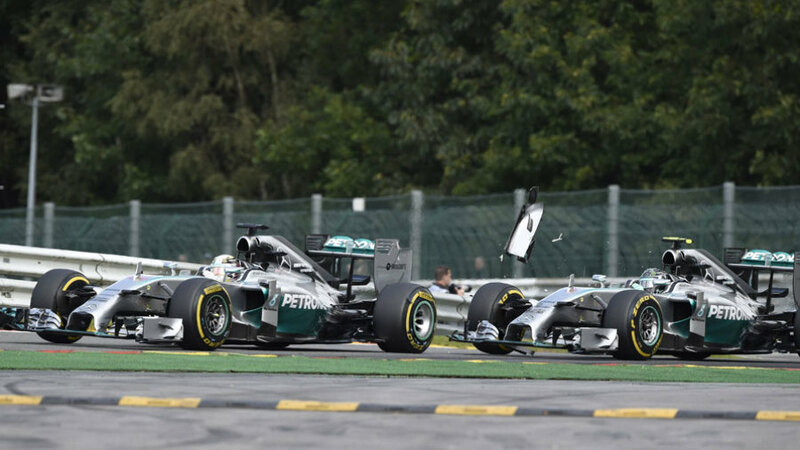 Nico Rosberg has taken the blame and been punished for his clash with Lewis Hamilton at the Belgian Grand Prix, following a meeting at Mercedes headquarters. Team bosses Toto Wolff and Paddy Lowe met with the drivers in the boardroom at Mercedes' Brackley base to discuss the event. According to a team statement, Rosberg "acknowledged his responsibility for the contact … and apologised for this error of judgement". The statement added that "suitable disciplinary measures have been taken for the incident", although details were not given. However, Mercedes also took the opportunity to state its commitment to open racing between its drivers, with the understanding that further contact will be dealt with severely. "Mercedes-Benz remains committed to hard, fair racing because this is the right way to win world championships. It is good for the team, for the fans and for Formula One. "Lewis and Nico understand and accept the team's number one rule: there must be no contact between the team's cars on track. "It has been made clear that another such incident will not be tolerated. But Nico and Lewis are our drivers and we believe in them. "They remain free to race for the 2014 FIA Formula One World Championship."